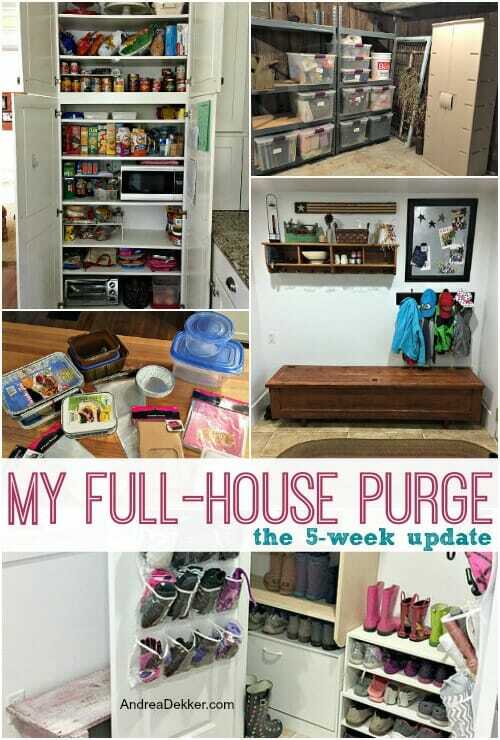 Just over 5 weeks ago, I shared my plan to complete a full-house purge BEFORE the New Year! Post Summary: focus on one room per week, every week until the New Year (16 weeks at the time) and purge up to 16 rooms before the New Year (most homes have 16 or fewer rooms). Since then, I’ve completed 5 rooms in our house, and I’m here today to share my progress, as well as offer more motivation and encouragement for those of you who are following along with my one-room-per-week plan. If you didn’t see my first post, or if you just didn’t get started 5 weeks ago, there is still PLENTY of time before the New Year (roughly 11 weeks yet). Go back and read my first post and get started with one room in your house this weekend. Even if you don’t completely finish your full-house purge before the New Year, you’ll still accomplish more than if you did nothing at all!!! I’ll share more of what I purged in the first group of 5 rooms at the end of the post. I wanted to tackle these areas first because they are all in constant use every day. 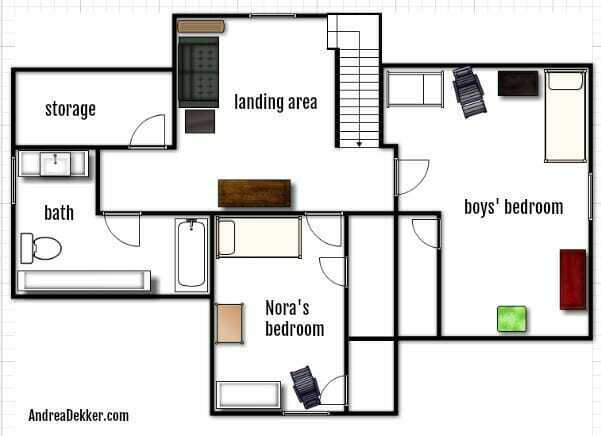 Also, as you can see by the blueprint photos below, these rooms are located in close proximity to each other on one side of the main floor (the basement is obviously it’s own area, but it’s right off the mudroom). 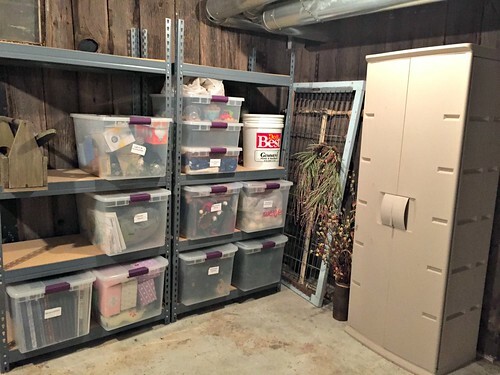 We store very few things in our basement — only in the “tool room” and the “potential future family room” — so although it seems like a big space to tackle, it only took me about 1 hour to “clean”, purge, and better organize the basement. 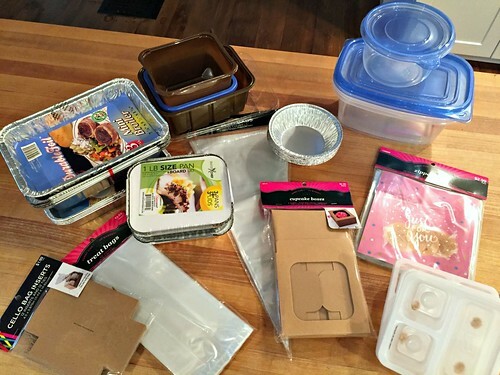 This was good timing for me too as I purged a bunch of holiday decorations I know we won’t use — which will hopefully make the decorating process go even quicker this year! These 5 spaces make up the rest of our main floor — I’ll start working on these rooms this weekend and be back in 5 weeks with an update on what I purged! 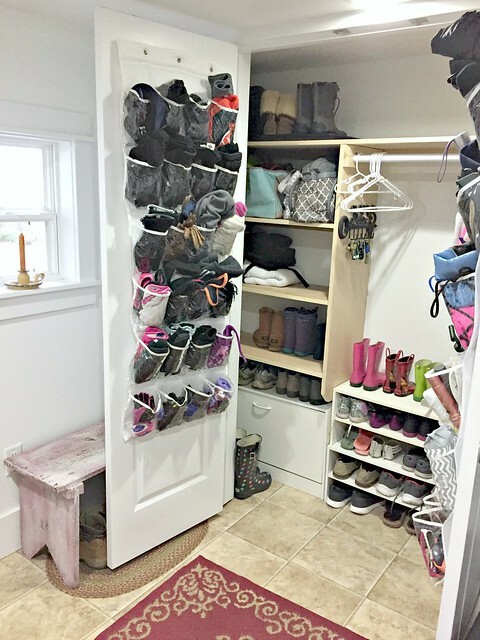 By starting with these 10 rooms, I’ll have the entire main floor (and basement) completely decluttered the week BEFORE Thanksgiving — which was my goal when starting this challenge. Then we can host holiday parties with less STUFF around! From Thanksgiving week through the New Year, I’ll tackle the entire upstairs — which is mainly “kid things”. I saved this for last as I know it will be MUCH easier for my children to purge knowing Nora’s birthday and Christmas are just around the corner. They will be more willing to part with their beloved treasures and out-grown clothing if they know there’s a chance they will get new items in just a few weeks! Plus, Dave will be home over Thanksgiving break and Christmas break — which means he can occupy them downstairs (if need be) while I finish purging upstairs! I hope to share my progress upstairs right around the New Year! My plan for the 5-week purging updates is to share a brief summary and a photo or two of each space. Feel free to ask more specific questions in the comments (or shoot me an email). However, I’m purposely not getting into too much of the nitty-gritty details in my post — otherwise we might be here all day! 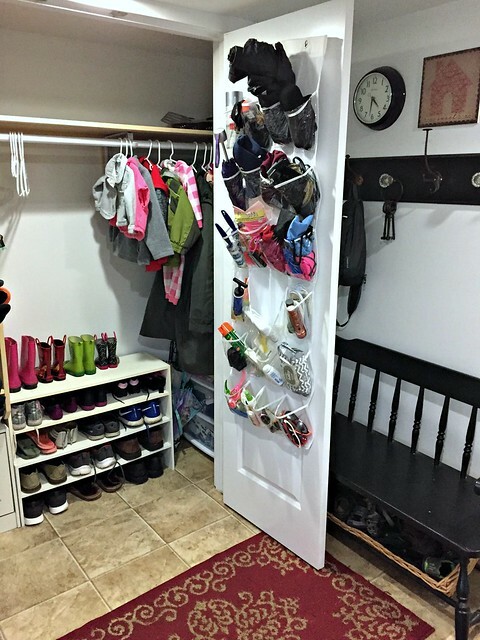 The mudroom was probably the most time-consuming room in this group — simply because I used this time to swap out all our summer things for winter things. I spent about 1.5 hours working on this space, spread out over a couple different afternoons. I put all swim suits, towels, goggles, life jackets, swimmies, and other pool/beach items away in our large storage bench. I got out our winter gear and had the kids try everything on. 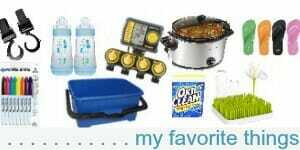 I organized the items into the closet and made a list of things we need to purchase for this winter. I donated several out-grown items and tossed a handful of worn flip-flops, broken goggles, deflated rafts, etc. The half bathroom was super quick and easy since we JUST renovated this space! It took me roughly 10 minutes to do a once-over of this room. I actually didn’t purge anything, but I did better organize a few of the cleaning supplies. I’m still LOVING all my empty shelves — I obviously haven’t decided what to store here yet! 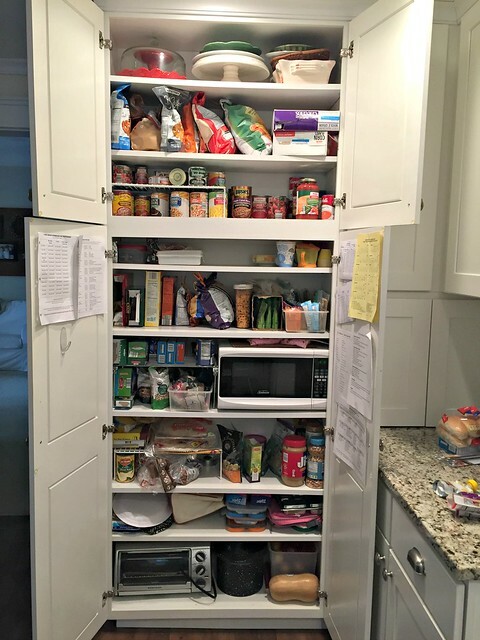 Some of you might remember my massive kitchen purge back at the beginning of the year… I got rid of SO much stuff. 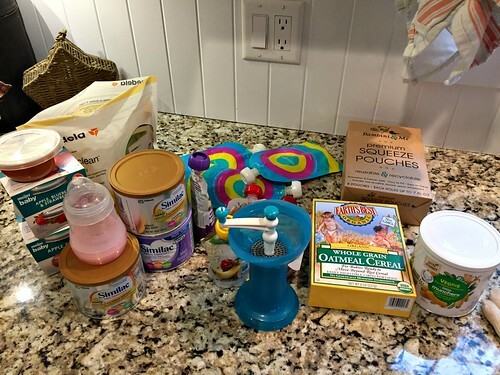 Because of that purge, this kitchen purge wasn’t nearly as intimidating as it could have been! The whole process took me about 1 hour — spread out over an afternoon with many breaks while I got new activities or crafts out for the boys, read them a couple books, turned on a show, got them a snack, and prepped some stuff for dinner. 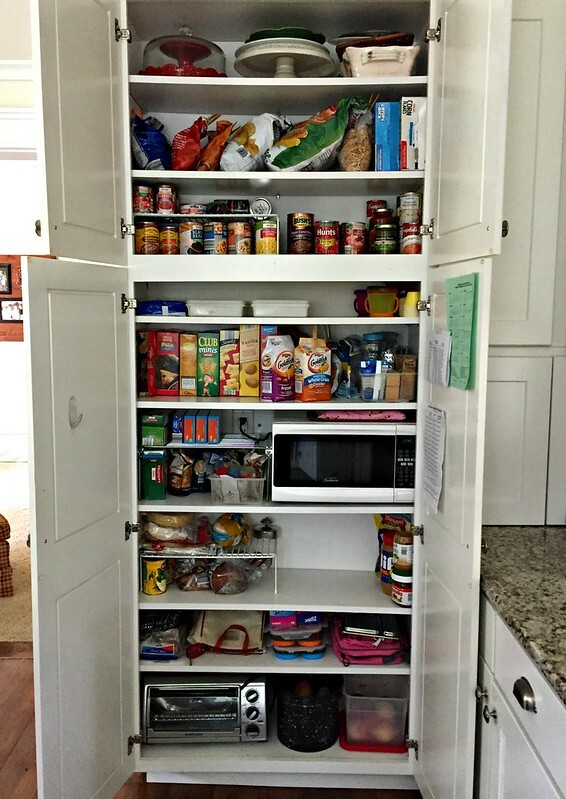 Here’s a look at our pantry area before — sort of all jumbled up and disorganized. 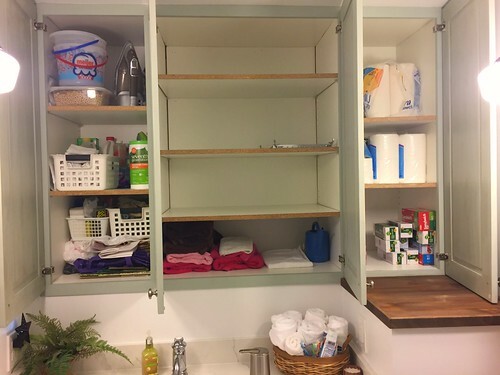 I realize the “after photo” doesn’t look much different — but I made more room for snacks and canned good, consolidated half-bags of things, made a point to use up several items, and just straightened things up a bit. Nothing major, but it looks nicer now! Another cabinet that got a mini transformations was the one to the left of our sink. I previously kept lots of baby items in this cabinet — formula, bottles, squeeze pouches, rice cereal, snacks, baby food, pumping supplies, etc. Since I don’t need those things anymore, I emptied out the top 2 shelves and now use them for my growing supply of decorative bags and disposable containers I use to give food gifts. We really don’t “store” anything in our dining room except some craft supplies — so this was another very easy room to tackle. I spent about 15 minutes quickly going through our craft supplies, and that was it. I purged broken crayons, dried up paint and markers, ripped or crumbled papers, sticker sheets that were almost empty, etc. etc. I also removed all the old pictures and drawings from my magnet board on the side of the fridge and updated them with more recent creations. As I mentioned above, we don’t store much in our basement, so my time down there was spent better organizing our pantry and freezer (I didn’t defrost it, just rearranged it) and purging some holiday decorations. I also used a broom to get a few cobwebs down, swept the floors well, and threw out a handful of boxes we had been saving in case we needed them for organizational purposes. All in all, the basement was about a 1-hour project, tackled in a couple 20-minute chunks of time. So that’s it for my first 5 rooms. 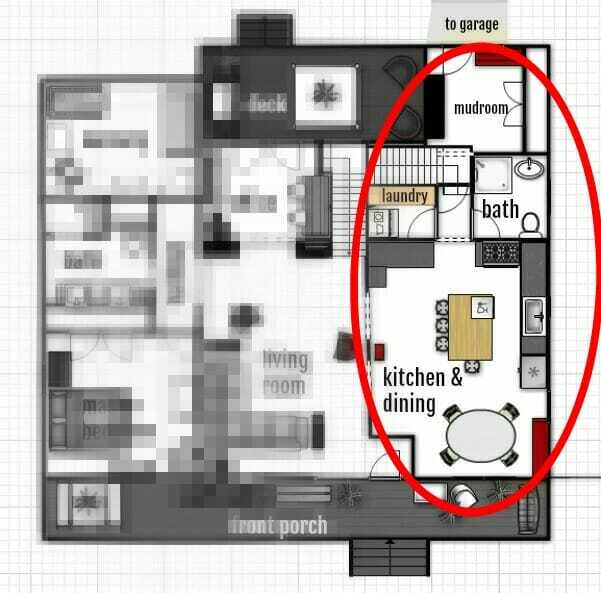 If you did the math, it took less than 4 hours of time for me to purge these 5 areas of our home — not bad at all! HOWEVER, there’s not a day in my life when I have 4 hours of uninterrupted, focused time to tackle 5 full areas of our house… that would have seemed so overwhelming to me (yes, even me)! By spreading it out over several weeks and focusing on one room per week, it was much less overwhelming – which means I was less likely to procrastinate! Who can relate to that!?!?! If you’ve been following along with my challenge, I’d love to know what type of progress you’re making as well! This is great! Love seeing the photos. Can you tell me how your shoe caddies are attached? I’ve only ever had the kind that have little metal pieces that hook over the top of the door, but they always seem to scrape up the door frame. Yours seem to be suspended in mid air!! Okay I might be a little off subject. 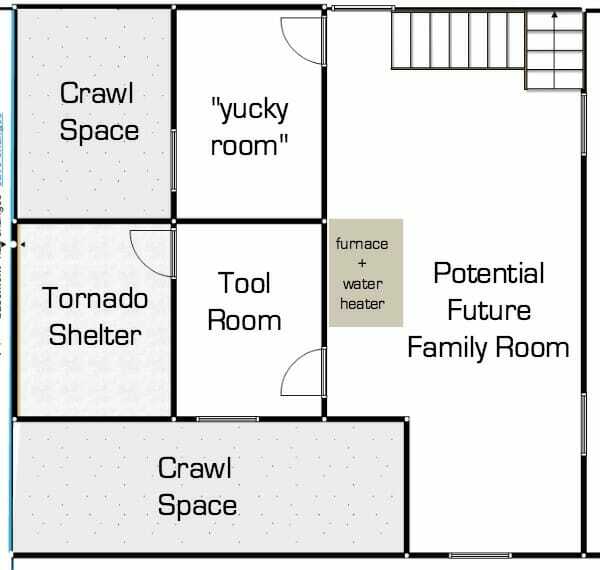 But what is a tornado shelter and what’s in it? haha — we have a really old house (130 years old) and apparently when they re-dug our basement (soon after a HUGE tornado went through our town 60+ years ago), they put a tornado shelter in. It’s basically a solid concrete room that we could go into and be safe from debris falling on us. We honestly don’t keep supplies in there, but if we knew a tornado could happen, we could quickly gather a few things and head down there. I haven’t been quite as busy as you, as I live in a small flat, but I’ve definitely made a lot of progress! I’ve finished our living room/dining area, kitchen and bedroom. Just the bathroom, spare bedroom and hallway cupboard to go, I’m so motivated to carry on. Thank you for sharing this challenge. I’m so intrigued by your tornado shelter! I’m from the UK so we don’t have anything like that. Do you keep any supplies in there in case you need them? Thanks again for sharing the challenge! yay for progress! Living in a smaller space means purging is even more important — sounds like you’re doing a good job! The original post inspired me to do a full house purge/fall cleaning. I am embarrassed to say that there are areas I haven’t cleaned since we moved in two years ago. It makes such a mental difference to see space in freshly purged areas and know those areas are clean! Thank you! yay!! and honestly, there are times when I realize I haven’t touched a space in a LOOOONG time too. I still don’t understand how it happens as I feel like I purge all the time! 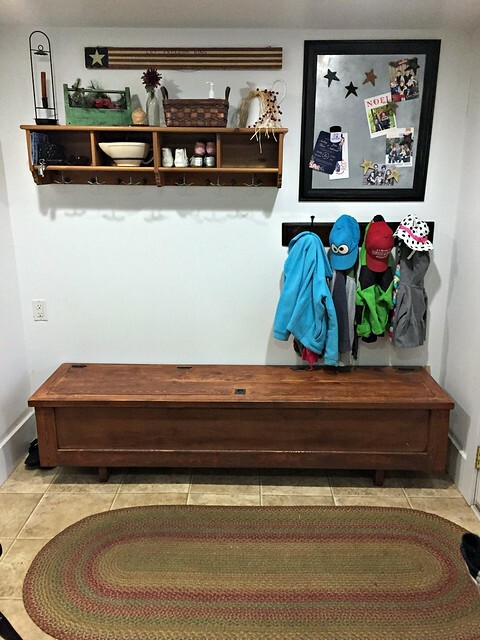 You might address this when you get there, but how do you purge your kids’ stuff? Do you involve them or just do it on your own without them? My girls’ room makes me cringe whenever I walk in there (literally! ), but I don’t even know how to start cleaning it out. it’s a mix — sometimes they have a say, sometimes I just purge because it’s trash! Great post but I haven’t started purging yet. Moving next year so thank you so much for the motivation to get started!! I also love the craft tower basket you have in your kitchen. Perfect for my daughter. Thank you for all the great ideas! get started this weekend! Honestly, it will make moving SO much easier! What I love about it is I can now see and start working on smaller organizational projects – like digitizing my daughter’s art work – because it’s all in one place and I have a clean and organized work space. 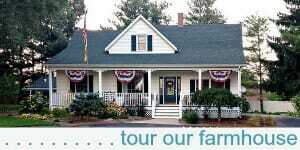 And I’m looking forward to the holidays – because I’m not stressed out about a cluttered home. Thank you!!! wow — way to go! You’re ahead of the game!!! Enjoy your hot temps… and good luck with the garage! Love these types of posts. Very inspiring! Also great reminder to purge before the holidays. I love your craft supply holder. 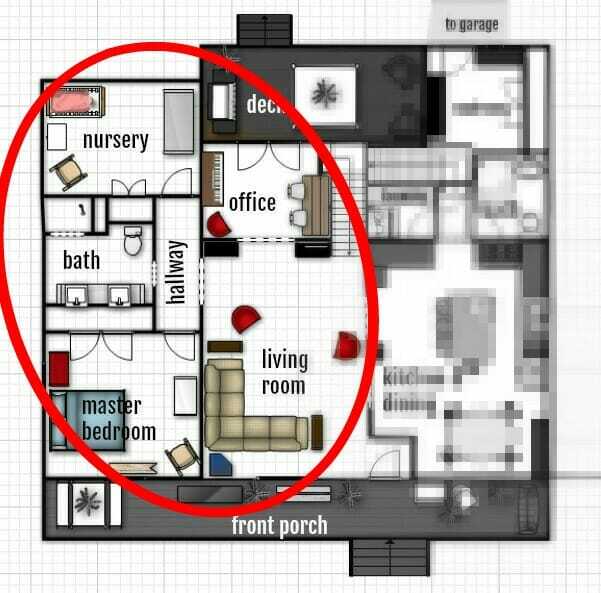 I’m going to start going through my house again and rethinking things to make it even more simple. Always a process. ah yes, purging before the hoildays is one of my favorite things to do. It helps me feel less overwhelmed when grandparents love a little “too hard” on our kiddos! I love having empty cabinets! Except mine don’t stay empty. 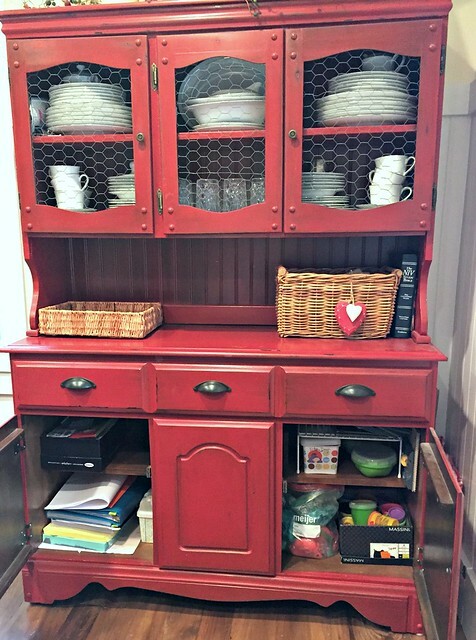 In my lower kitchen cabinet corner, which is really hard to get to, I store some things (not kitchen related). Also, in my bar cabinet, I have some of my son’s baby books for when he gets married, etc. I think the only kitchen thing in there is a cake stand. In all the upper cabinets to the right of my stove, being right by the door, my husband stores things like bug spray, crazy glue, etc. I do actually still have some blank space in my kitchen cabinets too though. I love it! 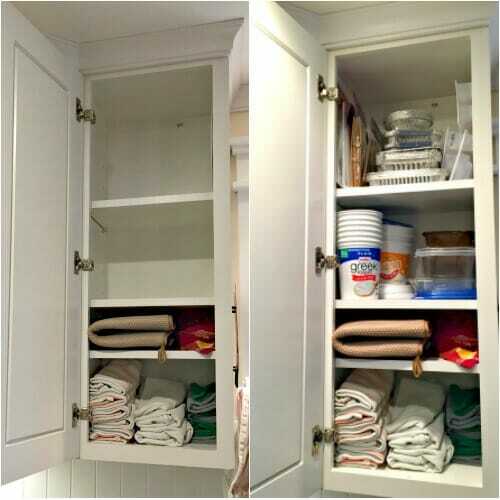 haha — empty cabinets never do stay empty for long — but that’s why I continually purge!!! Very inspiring! I need to do this. 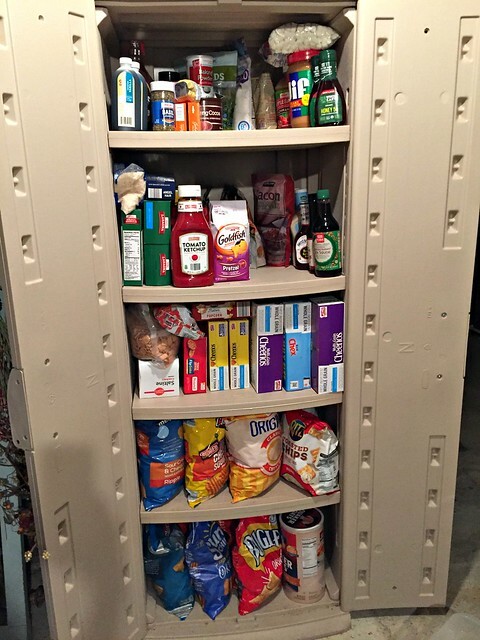 Can you tell me where you found the basement pantry unit? I love it! Can’t tell you how helpful this was for me. I’m inspired. I’m going to make a plan this weekend and start. It helps the way you broke it down. yay — glad to help!! 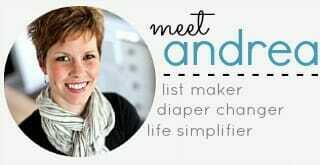 An inspiration for me to get busy at home! 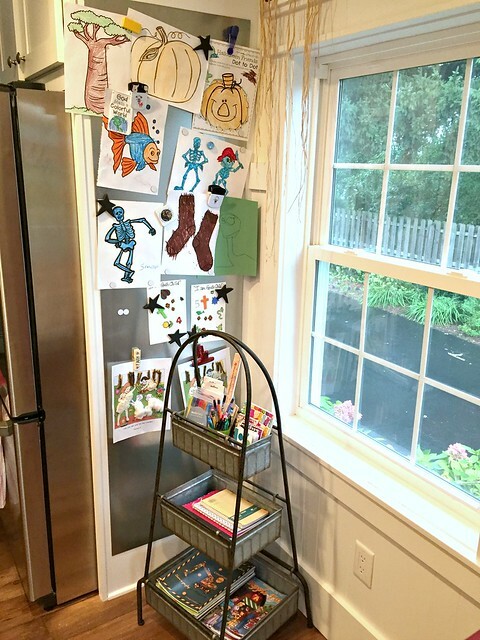 Can you tell me where you got the sheet metal for hanging the children’s art work and the frame in the mudroom? I just bought a framed magnet board… any craft or hobby store should have those! Love that you shared your rooms for this end of the year purge! I love the idea, but at first thought my low-clutter home didn’t need it. If you’re doing it- I can do it! I also love that some of your rooms took less than 1 hour. in my opinion, every room can ALWAYS be purged — even if it’s just some trash or 1 or 2 unneeded items! Especially this time of year when more stuff is bound to enter our homes sooner or later!